If you want to buy a car or a motor bike in the Philippines and register it in your name, this is a very straight forward process. All you have to do is, go to the dealer, pay for the car and he will do the registration for you. You can drive your new car straight out of the shop with a temporary plate number. To have the car registered in your name, you only have to write your name and address on a piece of paper and that's it. In the worst case you will need an ACR (Alien certificate of Registration) which you get at the Immigration Office but I didn't need that on my last registration. Once you have the car registered in your name, you have to re-register it every year at the local LTO (Land Transport Office) to get your yearly tax sticker for the plate number. But even there, you find helping hands in dozens of insurance company offices around any LTO in the Philippines. All you have to do is a Smoke Test (you find the test Centers around the LTO), then give your papers to one of the insurance companies and pick them up in the same afternoon or on the next day. You don't really want to do the whole process by yourself if you can have it done for you for a few Peso? Compared to Germany, used cars are very expensive in the Philippines and you really have to look after what you get for your money. Used cars in a reasonable condition start from 150,000,- Peso, used "Surplus" Multi cabs from 70,000,- Peso and Landroover Style 4 WD cars from 250,000,- Peso. Very old cars, like 15 - 20 years old are on offer from about 70,000 Peso. 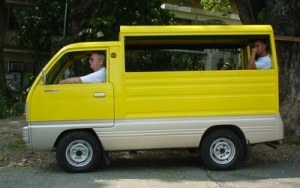 If you want to go for a new one: Surplus Multi Cabs are available from 180,000,- Peso, normal cars from about 500,000,- Peso, almost no Limit up.